For a longer holiday, a short trip or a business stay. In Hotel MARIS you will find suitable accommodation with modern facilities. Some of our premium double rooms have view onto the lake. Water boiler - coffee + tea incl. You want to book for a group? Please contact us by phone. 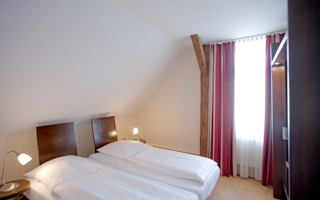 The rooms have a comfortable size between 23 and 31 m². They have a comfy lounge with chairs. Some of the rooms have a couch which can be converted in a bed for 2 people/children. 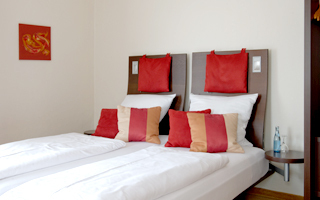 Our standard double rooms have a size of approximately 20 m² and are all located on the 1st floor. They have classy and modern furniture with a desk and two chairs. Children are always welcome. 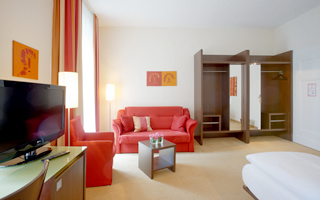 The size of our family rooms for up to four people is between 44 and 49 m². One room has 2 bedrooms connected by a corridor. 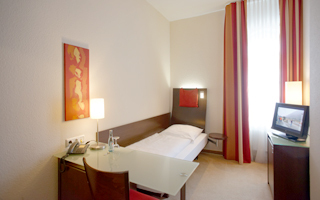 All single rooms have a comfortable size between 14 and 17 m². You can request an access code for free WLAN at check-in.